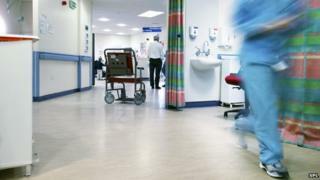 Basic mistakes in hospitals in England cost the NHS up to £2.5bn a year, Health Secretary Jeremy Hunt is to say. And the NHS could afford to hire more nurses if the errors were cut out, Mr Hunt will claim during a speech in Birmingham on Thursday. Cost is incurred through problems like medication errors, avoidable infections after surgery, and litigation. But a spokesman for the Royal College of Nursing said mistakes were the result of understaffed wards. In his speech Mr Hunt will describe these kind of mistakes as "expensive and wasteful" at a time when hospital trusts are trying to save money. He will say: "I want every director of every hospital trust to understand the impact this harm is having not just on their patients, but also on their finances. "More resources should be invested in improving patient care rather than wasted on picking up the pieces when things go wrong." A recently-published report commissioned by the Department of Health (DoH) described what it termed as "preventable adverse events" rather than mistakes, as costing the NHS "a significant amount of money". It estimates the cost of such mistakes are "likely to be more than £1bn" - and could possibly be as high as £2.5bn a year. Last year the NHS spent £1.3bn on payouts after being sued by patients over care errors. Four areas of poor patient safety highlighted by the DoH include falls and trips, bed ulcers, urinary infections caused by poorly fitted catheters, and deep vein thrombosis. Mr Hunt's words will mark the start of a poster campaign warning staff about the financial problems basic errors cause. The health secretary is due to argue that it would be wrong to set targets or "issue a new ministerial decree" in an effort to cut out such problems - instead he favours a "cultural change" to make hospitals safer. But Dr Peter Carter, chief executive of the Royal College of Nursing, said the government needed to invest in more staff before patient care can be improved. He said: "Falls and preventable conditions such as pressure ulcers happen when there are not enough staff on a ward to care properly for every patient, not because nurses are unaware that these things should be prevented." Labour have also argued that under the coalition government nursing numbers had fallen, and billions wasted on reorganising the NHS, which has resulted in care problems becoming more likely.